Rose Ann (Kimmel) Whitesell, age 72, of Shawnee on Delaware, and formerly of Somerville, NJ and Mechanicsburg, PA, died peacefully in her home on Saturday, July 28, 2018, following her battle with cancer. Rose Ann was born on Sunday, July 24, 1946 in Mechanicsburg, PA to the late John Israel Kimmel and Ruth Kuhns (Bushey) Kimmel. In addition to her parents, Rose Ann is preceded in death by her sister, Joyce Kimmel. Rose Ann’s survivors include her loving husband of 12 years and companion of 37 years, Peter I. Ferguson; her son, Richard Andrew Whitesell; her grandson, Remington Whitesell; her sister, Donna Botterbusch; her former husband, Robert A. Whitesell; her nephew, Adam O. Botterbusch, her niece, Carina A. Botterbusch; and three grand nephews. Rose Ann graduated from Mechanicsburg High School and went on to receive a Bachelor’s degree from Indiana University of PA and a Master’s degree from Rutgers University. After teaching one year at Northern High School in Dillsburg, PA she moved to New Jersey where she taught for 32 years at Bridgewater - Raritan High School in Bridgewater, NJ. She taught home economics and life skills and was well loved by her students and fellow teachers. After retirement, she and her husband, Pete set up the Stony Brook Inn in Shawnee on Delaware, PA. This was a life-long dream and she enjoyed furnishing it with her many collections and antiques. 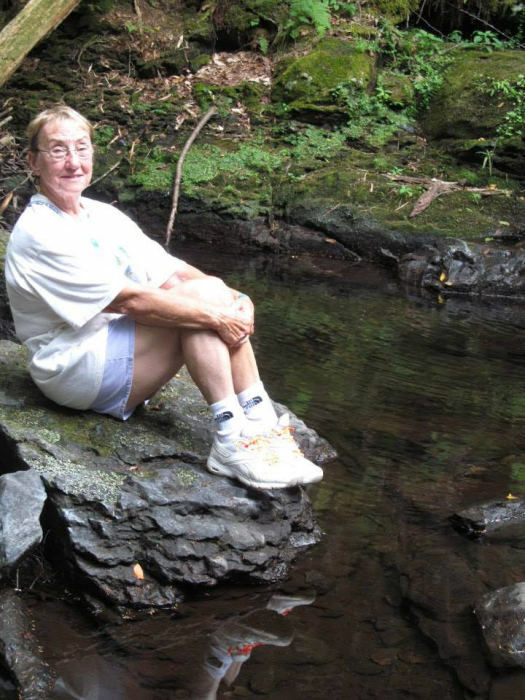 She was always on the move, traveling, hiking, kayaking and supported many environmental organizations such as the Sierra Club, Shawnee Preservation Society and the Delaware River Sojourn, as well as showing her guests the best hiking trails and waterfalls near the B&B. She was always ready for a trip to New York City to show others her love of the city and catch a show together. The beach was a yearly event over Labor Day for over twenty years. If she was not hiking or kayaking on the river, she had her hands moving with beading projects or knitting. She made many prayer shawls and tons of scarves. She was active in the Embroidery Guild of America and served on the Chapter Board as Regional Representative of the Pocono Mountain Chapter. She was both a consultant and collector of Longaberger and she decorated the B&B with hundreds of Longaberger Baskets. Every Christmas she would unpack her collection of Dickens houses to add to the decorations in the B&B’s living area. Winter did not slow her down either as she started skiing at age 40 and continued until just last winter. Twice she joined her cousin, Joan, in trips to Mississippi and Texas for Disaster Relief work following devastating hurricanes in those areas. She was a Deacon in the local historic church, Shawnee Presbyterian Church. The Shawnee women also had a Red Hat group where she enjoyed organizing and participating in many trips. She was also instrumental along with friend, Janet, in getting the yearly July 4th Block Party started in her village, as well as serving as an officer in the Shawnee Preservation Society. She supported the National Parks Association, visiting many National Parks. She reached her goal to visit all 121 Pennsylvania State Parks. She was known for sharing her passions with others, taking them hiking or teaching them to make Kombucha or to knit. She always had a smile and loved to show the many albums she created of not only her many trips, but the guest book signed by their many guests at the B&B. She was a friend to all she met, was generous with her time, sharing her knowledge of her passions, her books and her adventures of the day on Facebook. She was always willing to learn something new and most of the ladies her age could not keep up with her! All are welcome to join Rose Ann’s family at her Gathering of Family and Friends on Friday, August 3, 2018, from 11:30 a.m. to 12:30 p.m. at Myers - Buhrig Funeral Home and Crematory, 37 East Main Street, Mechanicsburg, PA 17055. A graveside service and burial will begin at 1:00 p.m. in St. John’s Cemetery in Mechanicsburg, PA, with Pastor Karl Viernstein officiating. All are also welcome to join Rose Ann’s family at her Celebration of Life on Tuesday, August 28, 2018, starting at 11:00 a.m. at Shawnee Presbyterian Church, 1129 Shawnee Church Road, Shawnee on Delaware, PA 18356; with Reverend Andrew Rienstra officiating. Contributions in celebration of Rose Ann’s life can be made to American Brain Tumor Association, 8550 West Bryn Mawr Avenue, Suite 550, Chicago, IL 60631, www.abta.org; or Compassionate Care Hospice Foundation, 248 East Chestnut Hill Road, Suite 4, Newark, DE 19713, www.cchfoundation.net; or Shawnee Presbyterian Church, 1129 Shawnee Church Road, Shawnee on Delaware, PA 18356, www.ShawneePresbyterianChurch.net. Rose Ann’s family has entrusted her care to Myers – Buhrig Funeral Home and Crematory in Mechanicsburg, (717) 766-3421. Read Rose Ann’s full obituary, view her picture, and sign her official guest book at Buhrig.com.